Top quality gear also comes at a price. In the case of Pure Digital's latest DAB radio, the Oasis, it's got nothing to do with money. Claiming to be waterproof, Pure's other suggestion that the Oasis is portable may be true, but personally we wouldn't want to lug this heavyweight around for too long. At least its rugged carry handle is up to the job of supporting the Oasis' bulk. Superbly built, its portability may be a moot point, but of most interest is its rechargeability. Simply plug the Oasis into the mains for a few hours and you'll get around 15 hours of DAB radio playback. That's down to the ChargePAK batteries inside, which is what also gives the Oasis its bulk. Aside from attaching an iPod or MP3 player into the Oasis' side-mounted roster of ins and outs, DAB is all you can listen to: there's no FM reception possible. Hidden behind rubber caps (for extra waterproofing) on the unit's right-hand side are not only that auxiliary input, but also a headphones jack and a USB port. Unfortunately, the latter is purely for connecting the oasis to a PC for downloading software upgrades from Pure Digital's website. The layout of the Oasis makes it a model that's almost too easy to use. Clad in rubber, the centre of the Oasis is occupied by a overly large standby button that's backed-up by a green light, and it's flanked either side by volume and tuning knobs. Five preset buttons lay beneath the two-line green LCD screen aside info and menu buttons for accessing the simple menus. There's really no need to delve into the menus though, because the Oasis tunes in automatically and super-quickly to all DAB stations in the area. Switching between stations has never been easier: simply turn the knob to the desired station and press. It might sound like a sensible, run-of-the-mill feature but most DAB radios are needlessly fiddly to use. Oddly, the malleable telescopic aerial can be removed by simply unscrewing it, although reception immediately breaks-up. 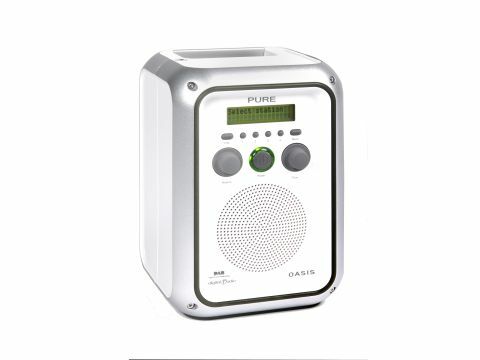 The Pure Oasis is a rugged little DAB that performs well with anything DAB radio currently pumps-out. We can't honestly say that the Oasis is a portable option for the summer, but sit it in the kitchen attached to the mains or whip it into the bathroom minus the wire if you fancy a blast of music while you bathe, and it'll last forever. It's splashdown time for Pure.